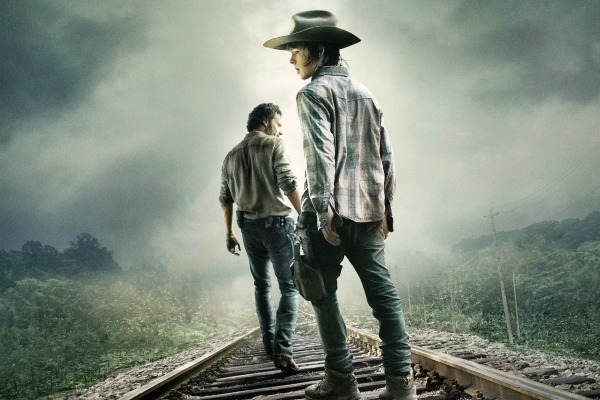 Going crazy waiting for The Walking Dead Season 4 to return? We’ve got some fun activities to keep you occupied. Ever notice how the waiting gets harder the closer you are to what you’re waiting for? The Walking Dead aired its mid-season finale back in December and when they announced that the show would return on Sunday, Feb. 9, it felt like forever. But with the holidays and the New Year, the time has been flying by… until now. Now that we’re just a couple weeks away from the return of The Walking Dead Season 4, it feels like we have to wait years and years to find out what happened after the survivors were scattered everywhere. But don’t fret, zombie lovers, we’ve got some surefire ways to keep your mind off the fact that there’s still over a week to go until the show returns. This one is kind of obvious, but really, is there any better way to spend your time waiting for The Walking Dead than by watching old episodes? You can relive every moment — from the time that Rick opened his eyes in the pilot episode, to the horrifying second that you realized the Governor was going to chop off Hershel’s head. AMC has every episode of Season 4 available to watch on their site, plus the last couple from Season 3. That means you’ll need DVDs to watch the rest, but that shouldn’t be a problem for you mega-fans out there. We at SheKnows were lucky enough to get our hands on a copy of this game from Z-Man games and we have to say that it’s pretty darn fun. If you pick it up, don’t be overwhelmed by the amount of pieces that come with it, nor the somewhat daunting instructions. There’s a handy little quick-start guide that will have you playing in no time and once you get the hang of it, you can take a peek at some of the more complicated rules — which will help you to find strategies to win. Just like the show, the game is brutal, so don’t be surprised if not all of your friends survive to see the end of the game. AMC has a lot of fun games set up on their website to keep fans occupied so they don’t realize just how long this hiatus has been. There are social games, apps to play with, photo quizzes and the ever-popular “Which Character Are You?” games. Now the network has added a new game just in time for the big game on Sunday. It’s called the “Zombie Bowl” and it lets fans vote for the zombies that have scared them the most. So if you’re hankering for some zombie activities, we recommend you hang out there for a while. Sure, this one sounds a wee bit obsessive, but let’s not fool ourselves, shall we? Fans of The Walking Dead have obviously been watching these previews for any hint of what’s to come when the show returns. We’ve just decided to go ahead and acknowledge it. With barely two weeks left, there’s no more need for pretense. If you want to watch the sneak peeks and the previews relentlessly looking for clues, we say go for it. It’s just one more way to keep your mind off the fact that the show won’t be back until Feb. 9. Serve zombie drinks, think of some undead-inspired food (or maybe go the survivalist route and just eat SpaghettiOs straight from the can!) and ask your walker-obsessed friends to show up in their best zombie costumes for a contest. Winner gets to hold the remote! Have you found any fun and unique ways to keep yourself occupied until The Walking Dead returns?